"With Alpha Anywhere, we were able to easily and quickly build an enterprise-level, cloud-based medical application that interacts with all major IT medical systems. Alpha Anywhere offers us the flexibility, speed of development and security that we need." Patient Innovations, based in Long Island, New York, is a medical IT software company that focuses on patients' most pressing concerns as well as medical practice management issues. The company is led by President and Co-founder Ken Greenberg and Akram Boutros, MD, FACHE, a healthcare executive with 20 years' experience directing some of the nation's most-respected institutions. Patient Innovations develops Web-based software and mobile friendly apps to improve the patient experience, while at the same time optimizing hospital and physician practices. Its first product, OnTime Care® is designed to eliminate waiting in doctors' offices, and optimize patient scheduling and appointment management to improve patient satisfaction, practice productivity and profitability. OnTime Care® is the first intelligent scheduling system that calculates the correct variable amount of time that a patient will need - start to finish - depending on the reasons for their visit. It will also calculate the correct variable length of time the physician and all medical personnel will need with the patient. The system eliminates one of the most egregious causes of doctors running late: overbooking. OnTime Care's SmartStandby® automatically fills canceled appointments as soon as they occur from an automated standby list. 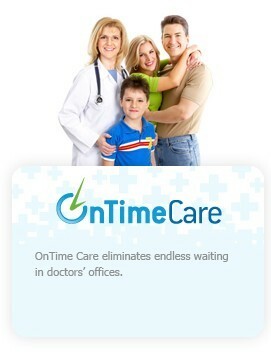 OnTime Care® also anticipates and fills no-show appointments. If the doctor is running late, OnTime Care® notifies patients to arrive later - closer to the actual time they're likely to see the doctor. Other messaging alerts patients to delays even after they've arrived. The VisitFlow Tracking® module uses a hybrid RFID system to measure encounters between all levels of providers and patients. This helps doctors see where they're needed most, and provides insights into the encounters. While VisitFlow Tracking® is geared to optimizing the medical practice, it also has applications in nursing homes and assisted living facilities because it can help providers do more effective rounding, and document all levels of care. Patient Innovations was looking for the best development platform for OnTime Care and additional products and plug-ins it plans to launch after that, including MySafe Medical Records for patient data, HealthMinders®, which reminds patients when to take their medications, and LovedOne Updates®, which notifies loved ones and care givers of patient status and activities. "We needed a solution that would let us connect to any core EMR medical system," Patient Innovations President Ken Greenberg says. "It also had to give us a full suite of tools to build enterprise-level software quickly, and to let us build mobile apps." ""It was the ideal solution. It lets us connect to any core medical system - even legacy systems - and it's a low-code solution, which means that we can prototype and build applications quickly." Greenberg contracted with Peter Conway, co-founder of CloudPerfect LLC to help build the applications, starting with OnTime Care. Greenberg and Conway looked at multiple solutions, and decided that Alpha Anywhere would be best suited for their needs. "It was the ideal solution," Greenberg remembers. "It lets us connect to any core medical system - even legacy systems - and it's a low-code solution, which means that we can prototype and build applications quickly." Conway adds, "I saw that Alpha Anywhere was great for rapid development by a small team, that it would allow us to use SQL Server as our database, and that it met all of the security requirements for a medical application." Under Greenberg's direction, Conway built the OnTime Care Web-based service using Alpha Anywhere. He lauds the user interface controls, which gave him the tools and flexibility to create a user-friendly interface. The system includes a VisitFlow Tracking®, a component that uses RFID equipment to track interactions between care providers and patients. An RF transmitter is located in each room in a practice. Healthcare providers have badges that the transmitters ping. When patients check in, they each get a badge assigned to them for the duration of their visit. In that way, practices can see how long patients are waiting in various rooms, and how long they are with a provider in each room or in a doctor's office for a consultation. The system also tracks RFID tags on hospital equipment, so staff immediately know where key medical devices are. This dramatically reduces time that staff previously spent looking for or moving equipment. This results in less frustrated nurses and doctors, and shorter visits for paitents. "I saw that Alpha Anywhere was great for rapid development by a small team, that it would allow us to use SQL Server as our database, and that it met all of the security requirements for a medical application." Because of its ease of building sophisticated Web apps, Patient Innovations built the OnTime Care Web app far more quickly and at far less cost than if it had used another tool. Although a mobile app hasn't yet been built for OnTime Care, Conway says that it will be easy to build one because of "the common component structure it shares with the Web site. I built the web app with mobile in mind, so it will be very easy to mobile-ize the existing browser components and build a Web app that can be deployed to Android or iOS. We were mobile-aware from Day One, and as we convert to fully mobile-friendly, it will be easy to do." OnTime Care has been tested by medical practices, and they have seen significant benefits from its use, Greenberg says. Patient wait times have been drastically reduced, doctors are spending more quality time with their patients, and patient no-shows can be reduced by 75 percent. Cancelled appointment slots are filled quickly and automatically, and appointments can be rescheduled or canceled in minutes. "It leads to big productivity and cost savings for medical practices," he says. "It can also lead to increased revenue because the practices have fewer unused slots. It can pay for itself in a half year." In addition, it improves patient satisfaction because there is less time spent waiting for appointments. UnitedHealthcare partnered with Patient Innovations to build the software to an enterprise level system and test it in one of their largest practice groups, Greenberg notes. Just using VisitFlow Tracking® in the initial test case, wait times in waiting rooms fell 4%, wait times in exam rooms dropped 13%, the time doctors spent with patients in exam rooms increased 57% and the time doctors spent in their offices consulting with patients increased 22%. This occurred with no loss of patient volume. Greenberg notes, "What gets measured, gets done. As doctors and staff began to visually appreciate the time they spent with patients, and the time patients had to wait, they began corrections. Adding SmartSchedule® to the test case will further improve results." Patient Innovations will be building a mobile app, HealthMinders, using Alpha Anywhere, which reminds patients to take their medications at the proper times. It was designed to improve healthcare, reduce hospital readmissions, and cut healthcare costs. It's also available as an add-on to the OnTime Care® platform. "We believe that the future of healthcare is bright, thanks to the technology we're building," Greenberg says. Waiting to see the doctor, or weeks for an appointment with a busy specialist is the number one patient complaint. OnTime Care® solves this problem, engendering patient delight while making the practice more efficient and profitable. It's a win-win, and a key component in everything we do is Alpha Anywhere." "It leads to big productivity and cost savings for medical practices. It can also lead to increased revenue because the practices have fewer unused slots. It can pay for itself in a half year."